The BD FACSDuet™ sample preparation system provides a powerful new level of performance to move the pace of your lab forward. 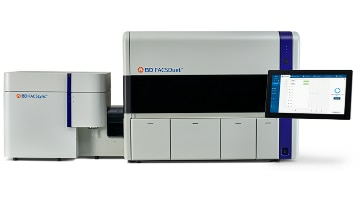 With pre-analytical automation, the BD FACSDuet drives workflow efficiency, consistency and standardization in the lab. Designed to complement and physically integrate with the BD FACSLyric™ flow cytometer, the BD FACSDuet provides a complete walkaway sample-to-answer solution. Through its automation protocol, the BD FACSDuet drives higher productivity and accuracy in your results, minimizing manual intervention, and with complete workflow traceability, it supports the labs to be compliant with ISO-15189 accreditation.